6AM is not a time to be competitive. What was supposed to be an active recovery WOD at CrossFit on Thursday turned into a WOD that forced me to take a couple of true rest days. It was a simple WOD. I row 175M then run 500M and repeat 5 times with a 2 minute rest in between. Being a runner, this was actually something I can do. It was a small class that morning. After the row, I found myself first off the rowers and out the door. That never happens. Then I ran, and I found myself first in the door. That really never happens. Then it all got to my head. I ignored the fact that my back didn’t feel right during warm up. I ignored my back as the pain got worse and worse with each round of the running. I was finishing in front, with the boys, I had to keep it up! It was also my last CF class for the next two months as I was taking time off to tackle two half marathons and two long distance trips all within a month of each other. So I was going out with a bang. Literally. By the last 500M run, I was hurting bad enough to finally slow it down. I went to work and I was in pain. I started thinking about calling around the office to see if I could bum some Advil off anyone. One person was nice enough to get some Tylenol from our Health and Safety department so I was able to shuffle over like a little old lady to Target to grab a small container of Advil. Lesson here kids…don’t get caught up in the moment. Your body is the boss, listen to it otherwise it will make your life very unpleasant. 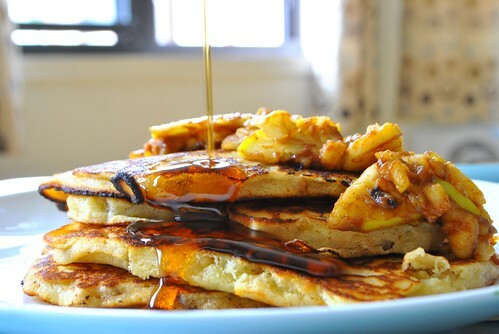 So body…can I offer up these Apple Cider Pancakes as a truce? Combine all the dry ingredients (flour, sugar, baking powder, salt, walnuts and buttermilk). Pour the dry into the wet and fold together until just combined. I melted my butter in the skillet I was going to cook my pancakes in. It helps pre-butter up the pan for the first batch, plus it starts the warm up process. Throw a small pat of butter in a skillet and heat until butter is melted and slightly crackling. Scoop out some batter into the pan and cook until the edges are set and the batter is kinda starting to bubble a bit. Flip and cook until other side is golden brown. This yielded four large pancakes for me. Two for now, two for later (or all for now)! 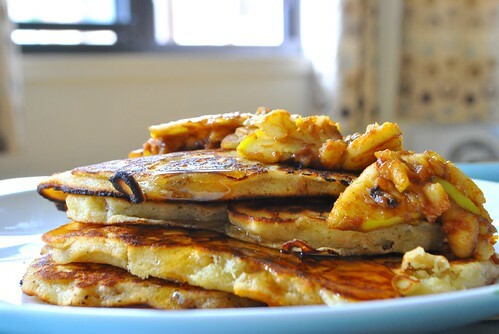 For some extra apple goodness, I sliced up an apple and tossed with 1 1/2 tablespoons of brown sugar + 1 teaspoon of ground cinnamon + a few good pinches of nutmeg and 1/2 teaspoon of ground ginger and let it sit until all the pancakes were done. 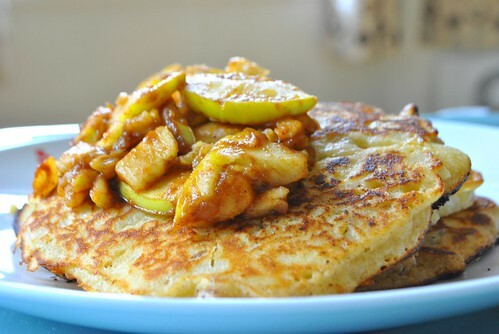 Then using the hot pan, added another good pat of butter and cooked down the apple slices until they were soft and added on top of the pancakes. The cooked apples added a good apple flavor. The pancakes themselves were really good and had a good apple cider tang to them. With some good maple syrup, it was a delectable fall breakfast. Hearty, warm and very yummy. So, body…we’re good now? Cause we have a 10 mile run tomorrow….half marathon 1 of 2 is just right around the corner! This entry was posted in Breakfast, CrossFit, Running and tagged Apple Cider, breakfast, Crossfit, Pancakes, Running. Bookmark the permalink. 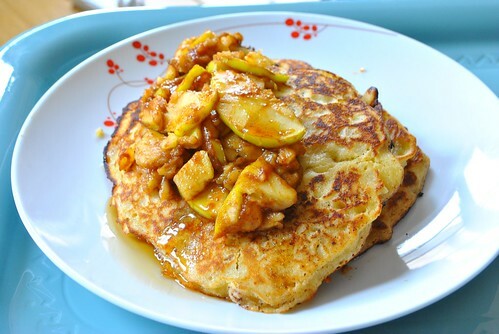 Love apples, love pancakes… Love this recipe!